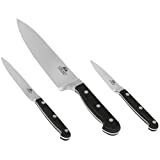 Chicago Cutlery Centurion 3-Piece Set includes 1-Each paring knife, 1-Each utility knife, 1-Each chef knife.Chicago Cutlery Centurion collection have high-carbon stainless steel blades with our exclusive Taper Grind edge that provides optimum sharpness and makes it easier to keep edges sharp over time. Full-tang blades coupled with a heavy duty forged bolster provide balance and strength. The black polymer handles give Centurion a classic look while the triple riveted construction provide safety.